Be the first to know when application for this course opens - click the 'Notify me' button on the right of this page. This course is designed to create a new breed of engineer, through a solid grounding of the Internet of Things (IoT) and Artificial Intelligence (AI), synthesised with a practical knowledge of machine learning, cloud and robotics. The aim is to equip you with the skills to solve problems, providing you with templates and a toolkit (code). The programme is based on a perspective of both AI and machine learning. AI is driven by deep learning algorithms. Deep learning is a wider case of machine learning based on automatic feature detection. IoT primarily involves data in time series formats (using AI algorithms like recurrent neural networks and long short-term memory (LSTMs)) and image-based data (using convolutional neural networks). Previous students have used the course to start a new career, for career progression or to have their skills upgraded by their employer. The course takes a problem solving approach and uses specific case studies from industry. Participants are expected to have a mind-set of exploration and to study and learn beyond the class material itself (depending on their existing familiarity with the subject matter). We cover handling large-scale IoT datasets and we aim to equip you with skills such as TensorFlow, Keras and AI in general, which can be used outside of IoT applications. Python is the primary language of the course and while we do not expect you to have full proficiency in it, we expect you to have a programming background. This is not an academic course, we focus on skills based/commercial products, however participants are expected to have an understanding of maths. Vibhu Gautam studied the Data Science for IoT course in 2017 and now works as a Data Scientist at Micron Memory Japan. 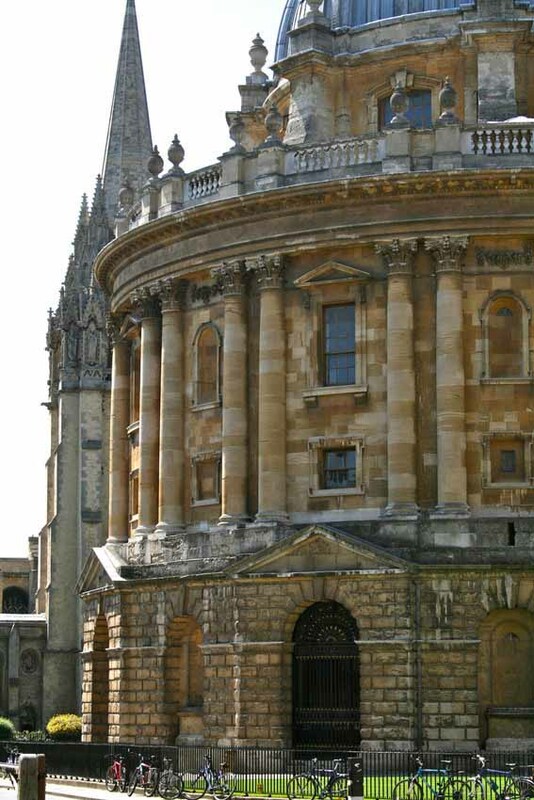 The course takes place in Oxford and online. There is a minimum attendance requirement of 75%. 1 - 2 hours online each week on Tuesdays (usually starting at 19:00). We recommend you allow around 10 - 12 hours study time per week in addition to the hours outlined above. You will be fully supported by the tutor who will be available during the week to answer questions. The tutor will also offer a number of one-to-one 'surgery sessions' during the course. A limited number of participants ensures that all those taking this course gain the maximum possible value. Students receive hands-on use of Dobot during the course. Dobot is a programmable, multifunctional desktop robotic arm, which allows us to explore multiple deep learning models such as neuro-linguistic programming (NLP), convolutional neural networks (CNN) and reinforcement learning (RL). Further textbooks may be added. Note that you will receive some of these books in digital format. 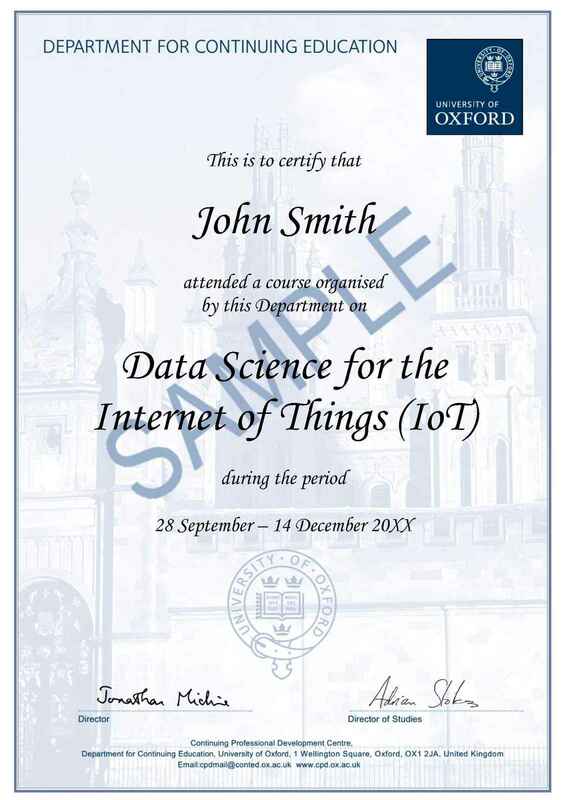 Achieve a minimum attendance at the Oxford classroom sessions of 75%. Answer all the weekly learning quizzes (these are short quizzes designed to ensure you have understood the material in each unit). Complete the short exercises that you are given. Ajit's work spans research, entrepreneurship and academia relating to artificial intelligence (AI), the internet of things (IoT), predictive analytics and mobility. Ajit currently works as a Data Scientist in the Bioinformatics space. The technical emphasis of his work includes Time series, Edge Computing and Deep Learning for sequences. Outside of Oxford University, he has been involved in teaching /academic programs at London School of Economics, Harvard Kennedy School, University of Madrid. Ajit publishes extensively on KDnuggets and Data Science Central and his book, Data Science for Internet of Things, is included as a course book at Stanford University. He was recently included in top 16 influencers (Data Science Central), Top 100 blogs (KDnuggets), Top 50 (IoT central), No 19 among top 50 twitter IoT influencers (IoT Institute). Ajit has been involved with various mobile, telecoms and IoT projects since 1999 including strategic analysis, development, research, consultancy and project management. In 2009, he was nominated to the World Economic Forum’s ‘Future of the Internet’ council. In 2016 he was involved in a WEF council for systemic risk (IoT, drones etc.). He has worked with cities like Amsterdam and Liverpool on Smart City projects in mayoral level advisory roles. Ajit has been involved in IoT-based roles for the webinos project (Fp7 project). In May 2005 he founded the OpenGardens blog, which is widely respected in the industry. He has spoken at Mobile World Congress (4 times), CTIA, CEBIT, Web 2.0 expo, The European Parliament, Stanford University, MIT Sloan, Fraunhofer FOKUS; University of St Gallen. He has also been involved in transatlantic technology policy discussions. Ajit is also passionate about teaching data science to young people through space exploration working with Ardusat. Dr Cezar Ionescu is Associate Professor of Data Science with the Oxford University Department for Continuing Education. His main interests include functional programming, correctness of scientific computing and machine learning algorithms, and the role of computing science in education. Peter Marriott is an industry practitioner with over 25 years database and software development experience on production systems. The main focus of his career has been working with data, working on business systems to make the data useful and available in a performant cost-effective way. 13 years ago he founded the consultancy Catalyst Computing Services, working with a wide range of clients in a variety of market sectors. Their first IoT project was in 2006. Peter has been involved working throughout the whole project development cycle of IoT: from prototyping proof of concepts; designing systems architecture; development; deployment and training of support staff. Peter runs training courses in cloud computing and database technologies for clients, gives career talks for undergraduates and speaks at various IT user groups. JJ Bernard has an MSc in Engineering from the Ecole Centrale de Marseille and an MBA from the University of Cambridge. He is also a certified Lean Six Sigma Black Belt. He currently works at Oracle as a strategy consultant, advising client on their technology investment with regards to their business strategy. Previously, he has worked as a project manager for Orphoz, a subsidiary of McKinsey & Company, focusing on defining and executing transformation projects. He has worked in diverse environments such as manufacturing, FMCG, public sector, steelmaking, mining, healthcare and automative. He has also worked for Accenture, both on business and IT transformation projects, for the financial services industry and the public sector. Claudiu is a senior professional with 20 years of experience in strategy, business analytics, data-driven decision systems and large-scale technology transformations. He is currently the Business Development Lead for Amazon Web Services Internet of Things in Europe, Middle East and Africa. He has significant experience in Internet of Things/ machine to machine technology and digital transformation using could computing platforms, from digital customer experience and digital processes to entire new lean enterprise business models. Claudiu has a degree in Economics, an Executive MBA and a Master in Computer Science with focus on data analytics and expert systems/ artificial intelligence. Paul joined Ocado in 2006. After establishing new teams for Simulation and Mobile development, Paul then co-wrote the first of Ocado’s award winning mobile apps. In his current role, Paul heads up Ocado Technology, whose 950+ software engineers and other IT specialists are responsible for building all the software and IT infrastructure that powers Ocado, and now Morrisons’ online grocery business too. Paul read Physics at St John's College, Oxford before then entering the computer industry. He has worked in software engineering, consultancy, interim management and a number of software start-ups. Devrim Sonmez is regarded as a high performing executive and entrepreneur with over 19 years of experience at intersection of digital and technology with various industries, over 10 years of Executive Board experience and taking a strategic role in securing M&A deals worth over $170 million in technology. In 2013, he became the CEO and co-founder of Blesh Inc. which is an award winning and innovative start up in IoT space developing IoT platforms and solutions through its own research and development. It is among the top Global 5 Mobile Proximity Solution providers and is considered the first global beacon solution provider of Google Physical Web technology since 2014 with exports more than 30 countries. He is still the Cofounder and the Board Member of Blesh. Alongside these positions, Mr. Sonmez has sat on the board of several more companies and associations including IOT.ATL a program of US Metro Atlanta Chamber that intends to boost the region’s tech sector in the burgeoning industry of Internet of Things products and software, the highly prestigious TUBISAD (Turkish Informatics Industrialists Association) and English Ninjas (An innovative mobile startup for English practicing), where his influence plays an integral part in grow and success. Devrim holds a Mathematics Bachelor of Science from the leading Turkish university in Ankara, the Middle Eastern Technical University graduating in 1998 and a Master of Business Administration from the Koc University in Istanbul, graduating in 2005. Since joining Microsoft in 1994, Paul Foster has worked across a wide range of sectors and customers, providing a mix of technical and strategic guidance around the creative use of technology in relation to their business needs. Paul is currently a principal software engineer at Microsoft. As an established public speaker across Europe and having spent a considerable amount of time working on the cutting edge of technology providing leadership and inspiration on topics like Smart Devices, Cloud Computing, Education and App Development. Paul is currently focusing on the building of next generation sensor webs which automate the gathering of data from disparate sources, and how to enable the creative analysis of this data to start a new era of perception. For a short time Paul was a member of a high-wire flying trapeze circus troupe, is a keen roboticist and an international marathon runner. Surya is pursuing an MEng in EEE from Imperial College London, specialising in Machine Learning and Embedded Systems. He started his journey in data science at a biotechnology startup, where he worked on characterising hand tremors of Parkinson’s patients to tune the product’s control algorithm (which stabilises the tremors). He spent last summer working on implementing neural network based applications on Android. He also leads workshops and events at the Cloud Google Developer Group in London, with a specific focus on Machine Learning frameworks, such as Tensorflow. Surya can usually be found tinkering with embedded hardware and software in the Robotics Lab at Imperial College. Barend Botha is a UK-based consultant working predominantly in the field of data visualisation. He is particularly interested in the growing future potential and roles that data analytics and visualisation will play across IoT verticals in in combination with Artificial Intelligence and the resulting products and insights for business and consumers alike. He draws upon past experience in research, design, development, management and marketing across various domains and disciplines. Bojan Komazec has been working in the IT industry for over 13 years. He currently holds the position of Senior Software Engineer in Avast Software where he has been developing various security and privacy products. Bojan's interests span from code craftsmanship and cyber security to Artificial Intelligence and Internet of Things. He is an active blogger and speaker at several IT Meetup groups where he enjoys sharing experience and knowledge. Bojan studied Electrical Engineering and Telecommunications and in 2004 received master's degree from University of Novi Sad, Serbia. Cheuk is a data scientist who has broad experience with time series forecasting including ARIMA and Holt-Winters models. She works with both machine learning and deep learning models and has also contributed to open source projects like Pandas and Dateutil. She has a strong academic and research background and was one of the top 0.4% students in Hong Kong. Cheuk encourages women to code and take up Data Science. Roy Allela is a Technical Evangelist for Artificial Intelligence and the Internet of Things at Intel. He is also an Intel Innovator and he has a strong passion for the application of nascent technologies to solving everyday problems. He is a Royal Academy of Engineering 2018 LIF Fellow and he emerged the Global Winner of the 2017 Edition of American Society of Mechanical Engineers ISHOW competition. He has a background in Microprocessor Technology and Instrumentation from The University of Nairobi. Roberto Barbero was born in Salamanca (Spain) where he studied his MSc in Computer Science and specialized in Artificial Intelligence. He developed his professional career in companies like JP Morgan, Veritas Software, Hewlett-Packard, VMware and Salesforce. He currently works as an IoT Specialist for Google supporting EMEA customers. Dan Howarth is passionate about applying machine learning to problems and opportunities. He believes any technical solution must be underpinned by a strong business case, value proposition and stakeholder buy-in to be successful in a business environment. Dan currently works for Altran, an engineering and R&D consultancy, as a Senior Consultant/Engineer in its Digital Division. He was previously at Rolls-Royce, working to apply machine learning to improve manufacturing processes for high value parts. His current focus is on Deep Learning, in particular Computer Vision, and how these technologies can be applied at scale, in real time, through the Industrial Internet of Things. He is also focussed on developing a framework to identify and develop machine learning opportunities in business. As well as qualifications in programming and machine learning, Dan is a Chartered Management Accountant and Governor at City of Bristol College, the largest further education institution in the South West of England. Maria Pocovi is CEO and founder of Emotion Research LAB, a computer vision company which explores how machines understand human emotions. Since 2014 the company has provided facial emotion recognition algorithms with on-line and on-premises solutions for real time applications. Maria is passionate about human technology interaction and the process of bringing new applications to the market which help companies empower emotional sensing on devices to prepare brands to provide the next generation of services, products and experiences to their customers. Maria graduated in Marketing and Business Administration from ESIC University, has an MBA from Catholic University in Valencia and an MBE from European University of Madrid. Concepcion (Conchita) Diaz works as a trainer in Big Data and Machine Learning at Google. Passionate about teaching technology and networks during her first 15 years of career she trained more than 5000 people in different countries (Spain, UK, Brussels, Germany, Holland, Belgium, Portugal, Italy, Poland, Russia, Latvia, USA) about how to design and optimize their networks. During this time she also wrote 10 educational IT manuals used around Europe about LAN/WAN networks, telephony over IP and data security. During this time, she became one of only 5 people in the world with six active CCIE certifications. While studying for her PhD a few years ago, she discovered the power of data and machine learning technologies, which changed her career completely to focusing on teaching these emerging technologies. Raj Sharma has over 15 years’ experience in software consulting with artificial intelligence (machine learning and deep learning) , big data (Cloudera / Hortonworks), Databricks and Cloud (AWS/Azure/Google). At Royal Holloway, he has been involved in implementing artificial intelligence cyber security algorithms (Kitsune) commercially based on an ensemble of autoencoders. Raj also has experience in creating big data pipelines for training and testing algorithms using GPUs in AWS/ Azure/Google; Spark ML library in Python and Scala. He has a strong software engineering background with mathematics and statistics.